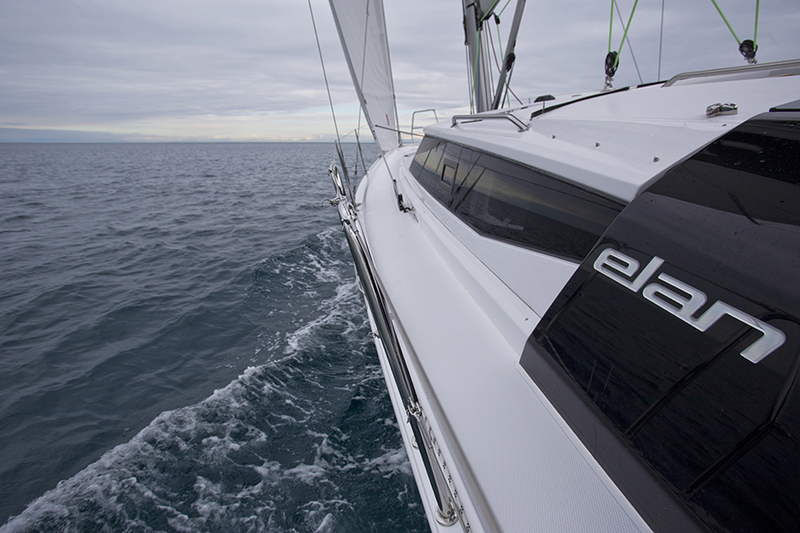 Here is a new boat from Elan, the first in the Gran Turismo series. The designer is Rob Humphreys, with some help from the Elan factory design team. In most cases you can read this as Humphreys did the hull, appendage and rig design, while the factory did the deck and interior. I quite like the look of the boat. The proportions are pleasant. The hull is beamy with an L/B of 3.2 and max beam carried almost all the way aft to the transom. It’s a very wedge-shaped platform. There is a chine starting at about station 2.5 and extending aft. The chine is used to pull volume outboard while retaining an arclike section in the stern to help reduce wetted surface. Of course when your stern is this broad, twin rudders are required so you can keep some rudder in the water as the boat heels. I think we are going to see more and more twin rudder designs as I can’t envision in the ongoing quest for volume that many boats in the future will have narrow stern sections. The upside to twin rudders is better control. The downside is a bit more wetted surface when the boat is sailing flat. True, the twin rudders are exposed and out beyond the protection of the keel but on the other hand you do have a spare rudder. Two years from now twin rudders on family cruising boats will be mainstream. The D/L of this hull is 145. Draft is 8 feet with a T-configured fin and bulb. There are four variations to the interior layout. You can have either two or three staterooms. You can also choose to have one or two heads.. The most interesting feature of these layouts to my eye is the fact that the galley is forward. I’m doing a new boat now with the galley forward. The forward galley spans the entire beam and this provides a lot of counter space. You can never have too much counter space. My preference would be for the two-stateroom layout with one head aft, but no doubt the three stateroom version will appeal to many. There were times I would have liked to separate my two boys. Renderings show a near centerline bench seat for dining but it does not show on the drawings. Sometimes I think the best way to judge the size of a boat is by how many people can sit and dine together in comfort. Why sleep six if only four can dine at one time? Note the large wraparound windows in the main cabin area. To my eye it looks like headroom may be compromised forward. This is a healthy rig with a SA/D of 19.88 based on the specified light displacement. The spreaders are swept 25 degrees with chainplates outboard on the hull. There is no mainsheet traveler and the mainsheet is a bridle type on top of the cabintrunk, forward of the midpoint of the boom. Twin backstays are used to help keep the transom swim step area clear. This is a very interesting deck design. There is a low molded bulwark. Stanchions come out of the top of the bulwark. There are some short jib car tracks just aft of the mast but other than that the veneered deck is very clear. Sheets are brought aft from the mast below the deck to emerge just forward of the winches. All lines will be within reach of the helmsman including the mainsheet that leads forward from the bridle. The GT5 has an amazing cockpit. It’s huge to begin with and has twin wheels mounted on “arms” that extend inboard from the edge of the cockpit. The cockpit seats are really wide and I like this. An 18-inch-deep seat works fine while eating or working but a much deeper seat is more effective for lounging. There are twin dining tables in the cockpit. With the swim platform deployed there is access to cockpit “fridge, grill and other amenities common on much larger yachts.” I can’t quite tell from the renderings how this works but I’ll take their word for it.